Happy sewing students as four classmates receive new machines. 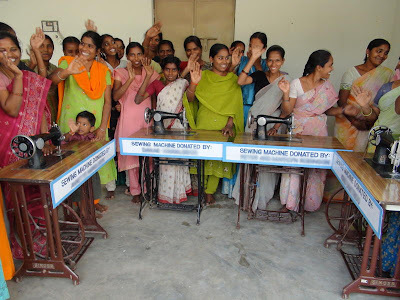 Stitching students in India were celebrating with the four class members who received new sewing machines. The four single mothers, who had completed the training, were given new Marrit-Singer sewing machines so they can start providing for their families. The nine month sewing program gives the women the skills needed to start their own business. After the nine month course, the women need a sewing machine and start-up materials.